Make sure you are not missing out on useful customer feedback. Of course, for someone who has no experience with this way of gathering information, starting to run surveys can be a little daunting. As always, you’ll want to make the user’s experience your first priority. This means taking a little extra care in crafting the surveys themselves and the ways that you promote them. Don’t go back through the last 5 years of business data and figure out everything you’ve ever wished you knew about your clients and their habits and dump it all into one survey. It would be great if all of your customers were willing to spend 30 or even 60 minutes answering your questions, but they are not. In fact, if you ask them to do this, they’ll probably lose a lot of respect for you and be less likely to do business with you again. You’ll probably have better results doing a short 5-6 question survey every few months. Since you’re adding frequent, short surveys, why not hook them into different actions that your site’s visitors are usually taking anyway? If you have a membership area, you could add in a quick survey between the login page and the member’s area. If you offer something for download, you could stick one in before the download is served. Make it feel like a quick, relatively unobtrusive extra step in the middle of an action that your clients are used to performing anyway. If you play this right, you can actually gain an extra layer of data that might tell you about the different types of answers you get from users engaged in different types of activity on your site. You have to be classy about these types of things. Remember that you’re asking for your clients to take time out of their busy days, and explain to them why you think it’s important for them that they help you out. Will the results of this survey be used to make your site nicer for them to use? Will it help to improve your products or services in some specific way? 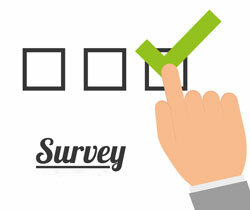 Let your clients know that you care about their experience with you and are offering this survey in order to make sure that you keep improving. Make them love you. They don’t have to be major incentives, just a little something commensurate with the effort you’re asking for. If you offer an information product and are using your surveys to improve it, offer clients a free or discounted copy of the new version for helping you improve it. It’s only fair. If it’s a membership site you’re asking questions about, consider giving a free week of membership for completing your survey. The other day I saw a bank offering free blankets for opening a checking account. I can’t possibly imagine whose banking decisions they’re trying to sway with this offer, but I’m sure they must have put some kind of market research into it. People like to feel rewarded. With a little bit of brainstorming about the types of information you could use from your clients, a little planning about how you intend to extract the information and put it to use, and some basic common sense about the way that you ask people for their help, you might just open up your business to some surprising potentials that have been right under your nose for years. Or you might strike gold with one client’s dead-on analysis or fond wish. A well-placed web based survey could change your life. Jason VandeBoom is Founder and CEO of ActiveCampaign, which is a leading web based software company with solutions including email marketing software, web based surveys, live chat for your web site, web based site editing, help desk software, knowledge base software and time tracking software.